ARRIS X-Speed 250B V4 is the latest version of the ARRIS X-Speed drone. 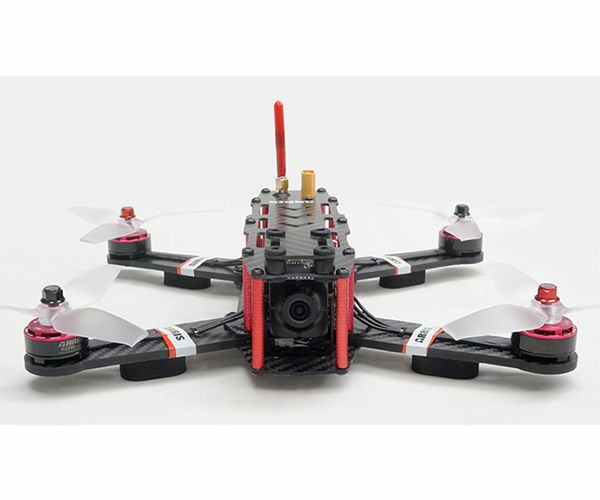 It comes with Flycolor Tower w/ 30A 4in1 ESC + F4 + OSD + PDB, ARRIS S2205 2300KV brushless motor,5042 high efficiency 3 blade propeller, Foxeer HS1177 V2 FPV camera,5.8g 200mw FPV TX and antenna. The receiver is optional, you can choose the one compatible with your radio. The quad is fully assembled and tested it. Bind and fly. One of the main change on the ARRIS X-Speed 250B V4.0 is the Raptor-S tower we use. Why we choose it? 2. The Tower structure design could protect the ESC well during the flight.ESC is one of the most easily broken parts on the drones except the propellers. According to our experience,some of the ESC were damaged by the propeller rotation or tree brunch cut after the damage when it installed on top of the motor arm.Some of the ESC were damaged due to the broken of the motor arm during the crash.For this tower, the esc integrated in the tower which installed in the middle of the quad frame, the ESC's can be protected quite well. 3. Raptor S tower makes the assembling of the fpv racing drones more and more convenient,the wires tidy and concise.Using this tower, you just need to solder the 4 motor wires to the holes, so easy. The lower board integrated the 4in1 ESC,the power port is in the center,bulge a bit over. This could not only make the connecting wires more convenient, but also avoid to interrupt the esc output port on the two sides. The upper board F4 flight controller board integrated with the OSD. There is also 5V,12V and BATV for powering the camera,video tx,LED and other equipments. 4. Small size and light weight tower fit for all sizes of the quad,and make the center of gravity of the drone lower. The weight of the raptor 390 tower is only 22g, with two layers tower structure, the height is only 15.1mm. And there are two plates on the tower,one is 4in1 ESC, and the other is the FC flight controller. If some of the components on the tower damaged, you just need to change one plate of the tower. Also it integrated with the OSD on it, you do not need to install extra OSD on the F4 separately. The diagonal wheelbaseof the ARRIS X250B frame is about268mm, and the inner space between upper plate and lower plate is quite big. Customer can upgrade or do some modifications as you like. For example, you can install 6 inches propellers on it. As all we know, the arm is easily broken part during the crash. ARRIS X-Speed 250B adopts4mm thickness arms, the arm is made of carbon and glass fiber composited plate,and there is almost no hollow design cut on the motor arm, so the weight is a little heavier than the 3mm one, but it improves the strength of the drone. Now we upgrade the camera to Foxeer HS1177 V2, one of the most popular fpv camera on fpv racign drones.The fpv camera angle i adjustable,the angle adjustable range is 0 to 45 degree. (pitch up)This could meet the requirements in different situation. High Brightness LED. ARRIS X-Speed 250B comes with a high brightness LED .And you can change the color of the LED light through the DIP switches. 7 color for you to choose.